If you’re overseeing an empire with Plutonic ruthlessness and efficiency, seducing your subjects first is a good strategy. 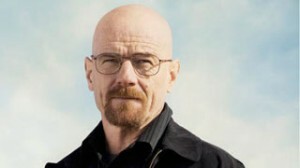 And so it’s been with “Breaking Bad,” which just completed the first eight episodes of its fifth and final season. I’ve written about Pluto’s irrevocable pull towards death via Walter White’s lung cancer and moral dissolution. It’s unquestionably the overriding archetypal energy within this series. But Neptune – the planetary domain of lies, deceit and the nebulous half-conscious state associated with communing with the transcendent world – is easily Pluto’s handmaiden. The seducer here is Walt (Bryan Cranston), the creator – in demented Henry Higgins-Pygmalion fashion – of his equally seductive partner crystal meth. Harvested on flat surfaces, the product in its container initially resembles a placid and hypnotic Neptune-ruled aquamarine pool – it’s “crystal blue persuasion,” exactly like the song tells it. And like ripples of water, Neptune imagery was boundlessly spread across several of this season’s episodes. Walt’s wife Skyler (Anna Gunn) seemed ready to end it all one night when she stared somberly into their pool, an eerie almost radioactive-blue nether region with a life of its own poised to seduce and swallow her into its largeness. Walt’s drug-enforcer brother-in-law Hank (Dean Norris) doggedly pursued Heisenberg with a proverbial Neptunian gauze obscuring the truth – until Gale’s inscription to W.W. in a book of Walt Whitman’s poetry helped pull back the veil. Given the direction of this series, make that a shroud. Even Whitman himself figured into the mix. Embracing the Transcendentalist movement, Whitman believed – in the spirit of Neptunian merging and obliterating of boundaries – that one could literally share one’s essence with others. That book-ended tarantula from the methylamine heist episode? The ancient goddess Athene, who spun fates, once reincarnated as a spider known as Arachne. Will Walt continue to spin or be caught within another Neptunian web that conceals its clever entrapment? And is Walt’s ability to perceive the outside world clearly, as through a glass jar that’s a breakable bubble ripe for the smashing, just like his beauty-pageant-quality meth which is cracked to pieces for commercial exploitation? Add ricin to the list too. Neptune rules toxicity and poisons, and Lydia narrowly escaped a somewhat organic execution by Walt – a bit of a Czech mate, here. But any evocation of ricin inevitably harkens back to the often drug-addled Jesse (Aaron Paul) and the poisoning of his friend’s son Brock through Walt’s poolside pot of lily of the valley. Neptune’s domain includes exotic plants and this one, containing heart-traumatizing substances, is traditionally known as a witch’s fave. Over the past four seasons, we’ve watched Walt refine his affinities with Neptune, which rules chemistry. He’s morphed from a forgettable presence as high school chem teacher – he’s perceived as that planet’s signature blur – into the meth-lab magician Heisenberg, with most people in his circle similarly clueless about his most recent identity. But when Walt recently declared, “You know who I am, say my name,” he seemed to have unabashedly thrown his idiosyncratic Heisenberg pork pie hat – deliberately too small for his swelled and still expanding ego – into the ring. My money’s on a ring of fire. Where Pluto lives.